Please join us for the next installment of the Whittle Readers children’s author series featuring local author and illustrator, Susan Stockdale. She has won numerous awards from the American Library Association and the National Science Teachers Association, among others. Susan will present her books, Stripes of All Types and Fabulous Fishes and lead children in a creative activity. This event is best suited for pre-school and elementary aged children. 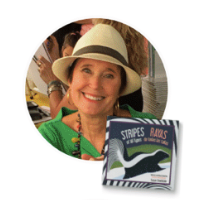 Susan will present her books, Stripes of All Types and Fabulous Fishes and lead children in a creative activity.